This richly colored Gulf mussel, with a shell like polished leather in a college library, plays bluegrass with a strain of Lynyrd Skynyrd. The official “faunal emblem” of the Australian state of Victoria, this native of Australia’s central highlands opens for Alabama Heelsplitter and adopts a wry, collegiate irony toward the whole Southern-rock thing. An eyeless spider from the karst caves of Bexar Country, Texas, it emerges as a jam band sometimes seen on the third stage at Bonnaroo. Another Texan, distinguished by a dark lateral face-stripe, the dionda diaboli plays old-timey songs of murder and sorrow. Swing, of course. When courting and breeding in the Purgatory Creek System, specializes in mating rituals involving tail-rubbing and gravel-kicking. This specialist in shimmering, Latin-toned world music was long known for committing suicide when caged, and so became a symbol of Mayan liberty. Signed to a label contract in 2004, it now breeds successfully in captivity. A ray-finned fish whose Wikipedia page is a stub indicating that it lives “only in America.” Perfected whiny college rock built around callow lyrical paradoxes while attending UVA. Wishes you would expand the stub. An insect of the order odonata, resembles the dragonfly but with wings parallel rather than perpendicular to the body; a weaker flyer than its cousin, it plays enchanting but sometimes precious songs of longing and heartbreak. 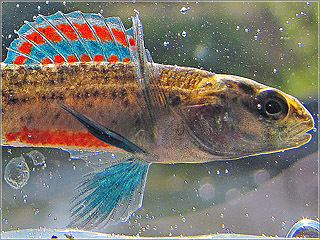 One of the stippled darters, with a faux-hawk that, I don’t mind saying, takes some upkeep, brings you its supple but glib indy pop from the highlands of southwestern Tennessee. Though nondescript and isolated when at home in Kentucky, can really kick out the upbeat Dead-cover jams on the road. Another Texan, with no eyes, twelve abdominal segments, and a deep catalog of ‘80s metal covers. Y’allternative, which is saying something for a mammal found only in India’s Assam state. Thomas Friedman is planning a column proving that the world is flat and full of fiddle tunes. Thought extinct by 1990 after a punishing decade, this mussel astonished admirers by reappearing in Killbuck Creek, Ohio, in 1994 with its draggy, seductive lounge sounds a bit smokier but otherwise no worse for wear. Decades of ponderous Vegas lounge crooning have left this leathery Madagascar native hard to love but even harder to get rid of. After disappearing from sight between 1843 and 1967, this small and droopy Australian is now ubiquitous thanks to its distinctive electronica. 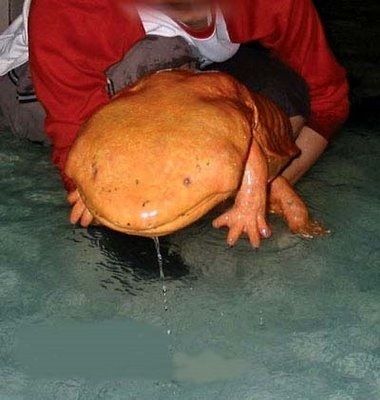 The largest anuran on earth, the foot-long, seven-pound Goliath Frog has only ever played straight-up rock and roll. Posted in I Found This Cool Thing!, The Wide, Wide World and tagged Endangered animals, protest songs, soul music. Bookmark the permalink. I hope the NatGeo documentary will incorporate the associated bands’ music. The arguments put foarwrd are thus far are surprisingly weak, because Purdy’s question goes to the very heart of political philosophy and what the role of government ought be.Let us rephrase the question this way: How does a people decide their economic destiny? Generally, a people comprise a society, and have instituted a government. The question then becomes: can the will of a people be expressed best through market forces? Or by the exercise of government?And if the will of a society is expressed through market forces, how is a people’s political will carried into effect, especially when that political will impinges upon market forces? For example, it has been generally accepted by almost everyone that there must be a shift away from dependence on imported fossil fuels. Yet, this has not occurred; in fact, the dependence on imported fossil fuels has worsened. The past three decades comprise an experiment in letting market forces and “investors” determine the direction of the American economy, and on the issue of energy security, this experiment has been a catastrophic failure. Market functions may be seen as the most democratic, in that people “vote” by making purchases. But there are a number of problems, beginning with the ones Kwak lists. Even more fundamental, however, is that the question must be faced of how democratic is it to allow society’s decisions to be based on markets, when markets will always be dominated by concentrations of wealth. In fact, in The Federalist Papers Number 10, Madison warns that it is exactly concentrations of wealth and economic interests that give rise to most pernicious political factions. (The majority decision in Citizens United vs FEC turned this argument upside down and obliterated Madison’s intent; so much for “conservatism.”)In the history of the United States, economic development has always been the result of market forces being set in a general direction by the “grand strategy” laid down by the federal government. This general framework was firmly established and elucidated in the reports of first Secretary of the Treasury Alexander Hamilton (the Reports on Credit, Banking, Manufactures, and the Constitutionality of the Bank of the United States.) Conservatives have written Hamilton’s reports out of history, because the reports clearly specify an activist role for government. Among the first policies enacted by Congress were measures to encourage the development of manufactures, most especially the manufactures of gunpowder, armaments, and naval stores. In fact, the early development of machine-cutting tools is almost entirely the story of the armories in Springfield. Mass, and Harpers Ferry, Va. The machinists and foreman from these armories are the people who have names like Pratt, Whitney, Fellows, Jones, Lamson, etc. This is the nucleus of modern world industry. After the War of 1812, the War Dept. issued a requirement for firearms with interchangeable parts. This is really what launches modern machining, and also, mass assembly.A key “grand strategy” of early government was to encourage the settlement of the west, and the development of a transportation system that would bind the nation together. Most significant in this area were the construction of the Erie Canal, and the Illinois-Michigan Canal (the latter created the city of Chicago, 1835 to 1852). The application of steam to rail transit beginning in the 1830s included a very important role played by Army Engineers, especially in civil construction. This has been almost entirely written out of history the origins of modern industrial management are actually the railroad companies, based almost entirely on railroad executives who had been U.S. Army officers, who had developed the skills in provisioning and leading the many Army Topographical Corps of Engineers expeditions following Lewis and Clark, the placing and construction of military outposts on the frontier, and the supplying of those outposts. First steamboats down the Ohio to the Mississippi in the 1830s, also. River improvements, including the work of Colonel Henry Shreve. The maritime application of steam propulsion was largely dependent on the 1850s experiments and work carried on by Navy officer Benjamin Franklin Isherwood, who headed the Navy’s Bureau of Steam Power during the Civil War (and whose name is on the engineering building at the Naval Academy today). The development of civil aviation was deliberately supported by the federal government through the awarding of airmail contracts. The development of commercial applications of radio came as a deliberate policy by Navy officers after the end of World War One. Similarly, the development of commercial applications of computers came as a deliberate policy by the U.S. military after World War Two, especially the support given to Seymour Cray after the war by the U.S. Navy.The auto industry was supported by government policy, prodded into action by the “good roads movement” of the 1910s and 1920s, which demanded a massive national network of paved roads. The emergence of the independent gasoline service and station was made possible only by the government (court) ordered dissolution of the Rockefeller monopoly on gas production and distribution. And of course, there is Eisenhower’s Interstate Highway System that completely transformed so much of the U.S. economy in the 1950s and 1960s, including creating the geometry that allowed the growth of suburbs and the housing boom after the War. So, in general, the history of American economic development is that of grand national objectives set in place by government policies and actions, creating the environment in which free enterprise and market forces could flourish. The problem today is that we have supposedly brilliant people who argue that market forces should be left alone to determine the direction of society.